Quick overview Explains the world of research both for those who must use it as part of evidence-based practice and those undertaking research. This title provides guidelines on critiquing research articles and producing successful reviews of the literature, with many tips on producing assignments that really work. Struggling to understand the language of research? Need to understand the basic principles and processes of research? Do you find it difficult to know how to apply research to clinical practice? 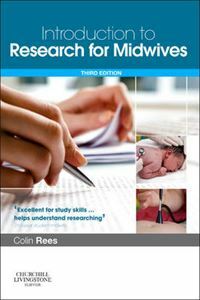 This third edition of "Introduction to Research for Midwives" is the answer! In simple language, it explains the world of research both for those who must use it as part of evidence-based practice and those undertaking research. The content is particularly student-friendly and provides clear guidelines on critiquing research articles and producing successful reviews of the literature, with many tips on producing assignments that really work. All midwives and other health professionals will find this book invaluable in applying research to their own practice.